Living in a rural community, you never know what opportunities for barter may arrive at your door. A neighbor of mine raised a couple of steers this past year and she offered me 25 pounds of unrendered beef suet from one 600-pound (hanging weight) steer in exchange for some of the rendered fat, which is called tallow. She knew I was interested in cooking with beef fat because of my new cookbook, The Fat Kitchen. Heck, I said, I'll throw in a copy of my book along with the tallow. I rendered the fat this week. The nice thing about suet (the fat from goats, sheep, and cattle) is that it is so hard, it grates nicely in a chilled food processor. And when you grate the suet into something that looks like the powdered, dried Parmesan cheese that comes out of a green canister, it melts very, very quickly. In fact, grating and rendering the 3-pound batch I made took less time than the clean-up (about 45 minutes). The tricks with using a food processor to grate animal fat are to do it only with suet, a very hard fat (so as not to gum up the works), chill the grating blade well and use the suet straight out of the freezer, and don't force the suet through the blade (don't burn out the motor). You'll need to use muscle to push the suet through, but when you get real resistance, stop. Often you can take several slivers of pieces that didn't go through, turn them 90 degrees, and try again, pushing them so the thin edges meet the blade. The grated suet looks like grated Parmesan from one of those green canisters. Put the grated fat in a heavy saucepan and melt over low to medium heat. As soon as it is all melted, strain it through a fine sieve (discard the solids or feed to a pet) and pour into a shallow pan to set. Then clean up. The clean-up involves using a pot of boiling water to dip all your utensils in, then wiping them clean before washing. Use the same boiling water to rinse out the saucepan you used. Then dump the water outside -- not down your drain. The melted fat will be golden but will turn white as it hardens. Sometimes, depending on the steer's diet, the white will have a yellowish cast. I know this batch of fat came from a steer that was most grass-raised and "finished" with some vegetables, including a little corn. What am I going to do with all the fat? I'll use it for all my frying. It's the best for producing a crispy coating on french fries, potato pancakes, fritters, fried chicken, fried fish--you name it. And, if you want to suggest a barter for some of it, I am all ears. Fried chicken is extra crispy when fried in lard. I’ve just joined Healthy Fats Coalition in time to celebrate the first annual National Lard Day, a celebration of pure lard, a traditional, authentic animal fat that is now enjoying a resurgence within America’s food culture and in home kitchens. National Lard Day is the brainchild of the Healthy Fats Coalition, a group of like-minded organizations, companies and individuals that have developed an educational initiative dedicated to the proposition that healthy fats aren’t merely having a moment – they’re here to stay, as an essential part of the American diet. The HFC’s mission is simple: affirm that animal fats deserve a central place in kitchen, on the table and in the popular imagination. While writing The Backyard Homestead Book of Kitchen Know-How, I started working with animal fats because people who raise their own meat animals are blessed with an abundance of animal fats and I wanted to learn how to work with them. I discovered that the fats contribute great flavor in the case of poultry fats and great texture in the case of all animal fats. Now I love working with animal fats and I’m happy to share the love. Rendered leaf lard is great in cookies, as long as the lard has been rendered so it is neutral in flavor. I just made a batch of Polvorones, a lard-based cookie from Spain. The recipe originates from a point in the Spanish Inquisition when it was illegal to make these cookies with anything but lard (to smoke out Jews and Muslims, who were prohibited to eat pork by their religions). If that history weirds you out, but all means, call these cookies by one of their other American names, including snow balls, moldy mice, sandies, sand tarts, or butterballs. Or call them biscochitos (as they do in Mexico), tea cakes (as they do in Sweden and Russia), dandulas kiflik (as in Bulgaria), biscochos (as in Cuba), des kourabi (as in Greece) or rohlichky (as in the Ukraine). They were also called polvorones in Italy. A cookie so widely adopted, and so thoroughly time-tested must be good, and it is. It is! 1. Combine the nuts and 1 cup of the confectioners’ sugar in a food processor. Process until the nuts are finely ground. Add the lard and vanilla and beat until light and fluffy. Beat in the flour and salt until combined. Cover and refrigerate the dough for about 1 hour or until firm. 2. Preheat the oven to 350° F. Line three lard cookie sheets with parchment paper. 3. Form the dough into 1-inch balls and place 2 inches apart on the prepared cookie sheets. 4. Bake, one cookie sheet at a time, for about 15 minutes, until the cookies look dry and cracked. The color will not change much. 5. While the cookies are baking, place the remaining 1 cup confectioners’ sugar in a shallow bowl. 6. Cool the cookies on the parchment sheets for a few minutes. While the cookies are still warm, roll them in the confectioners’ sugar. Place on a wire rack to cool. 7. When the cookies have cooled completely, roll them again in the confectioners’ sugar to give them an even coating of sugar. Store in an airtight container between sheets of parchment or waxed paper. They will keep well for at least 1 week. I’m so excited that Melissa Pasanen will write about the Fat Kitchen for Seven Days! The article will come out on November 14, which just happens to be the pub date when the book goes on sale. I’m especially pleased because customs has held up the shipment of books that is meant to go out to reviewers and critics. The stores got their allotments, but somehow this one batch of books was flagged for a closer look. While I don’t doubt that my book deserves a closer look — and some might even consider the idea of returning animal fats to the table a subversive idea—its a darn shame that reviewers aren’t getting the book as promised. I was able to squeak out one copy for Melissa—that was the first problem solved. Next problem, what do you feed a journalist you want to impress? I started with duck-fat popcorn. As we munched and chatted, I handed her jars of rendered fat that I wanted her to see and smell. No porky, beefy, ducky odors there! But she did detect a note of nuttiness in the bear fat I presented here. “Oh! I’d really like to taste that,” she said. No problem, I whipped up a little sautéed cauliflower, which was just delicious. Then I got down to the serious business of making chicken fat biscuits to go along with the chicken pot pie filling I had made earlier. Then it was on to an apple tart. Pastry made with lard is easy to handle. I filled the free-form tart with duck fat caramelized apples. This is the recipe I followed. It’s from The Fat Kitchen, of course! 1. Prepare the biscuits according to the recipe directions, but do not bake. . Place in the refrigerator. 2. If you are using fresh root vegetables, place in a saucepan, cover with water, and add about 2 teaspoons fine sea salt. Bring to a boil and boil until just tender, about 10 minutes. Drain. If you are using fresh summer vegetables, steam over boiling water until tender, about 5 minutes. If you are using frozen vegetables, remove from the freezer. 4. To make the creamed chicken, melt the fat in a large saucepan over medium heat. Add the shallots and garlic, if using, and sauté until fragrant and limp, 3 to 5 minutes. Sprinkle in the flour and stir until all the flour is wet. Whisk in the broth and stir until thickened and smooth. Stir in the chicken, vegetables, and thyme. Taste and adjust the seasoning with salt and pepper. Bring to a simmer. Keep hot while you bake the biscuits. 5. Remove the biscuits from the refrigerator. Bake according to the recipe directions for 15 to 18 minutes, until the biscuits are golden. 6. To serve, split open one or two biscuits for each serving. Ladle the chicken and vegetable mixture over the biscuits halves and serve immediately. The Fat Kitchen is Almost Here! For the past three years, I have been working on a book on cooking and baking with animal fats. I started exploring this topic because animal fats are an important part of nose-to-tail eating and supporting our farmers. I stayed with it because animal fats impart wonderful flavor and delicate texture to baked goods and fried foods—whether deep-fried or pan-fried— are remarkably not greasy when cooked in animal fats. And I am staying with it because when I looked into the health aspects of eating fats, I came to the inevitable conclusion that the industrially produced vegetable seed oil (canola, corn, etc.) are at the root of many health problems brought on by inflammation (heart disease included). Fat tastes good—and it defines the flavor of traditional cuisines around the world: think duck fat and butter in France, ghee in India, olive oil in Italy, lard in Mexico, schmaltz in Jewish cuisine. Salt pork was crucial in defining the flavors of American cooking, especially in New England and the American South, where they called it "streak of lean." In England, cooks made use of beef fat in the signature dish of Yorkshire pudding (made with beef drippings) and in many pies and pasties (made with tallow in the crust). Suet, unrendered beef fat, is a necessary ingredient in many English steamed puddings. Lard and other fats derived from pigs were once the most widely used fats all around the world. Even in Italy, lard was used extensively, especially in the North, where the climate did not lend itself to the growing of olives. But with the rise of industrialized food production the world over, fats derived from animals fell out of favor. Some of this was due to the cheap production of vegetable seed oils, helped along by some very clever marketing by Crisco and Wesson, which touted the "purity" of their products. At the same time, the urbanization of the population and a change in how meat was raised and purchased in supermarkets, helped changed the central role animal fats once played. But much of the switch from animal fats to industrial vegetable seed–based fats and oils was due to flawed medical science, which drew a link between the consumption of animal fats and heart disease. An army of public health advocates and government policy makers spread that false claim like it was gospel. All animal fats are not created equal because all animals are not raised under the same conditions. When I write about cooking with animal fats, I am writing about fats from pasture-raised chickens, ducks, geese, pigs, lamb, goats, and cattle. I am not writing about animals raised or finished on grain in concentrated animal feeding operations (CAFOs). Such large-scale animal operations aren't remotely healthy environments for the animals, so the animals are dosed with antibiotics, which also allows them to gain weight faster. This, in turn, alters the flavor and nutritional content of the fat. The fat from industrial-farmed animals contain fewer anti-inflammatory omega-3 fatty acids and more pro-inflammatory omega-6 fatty acids than fat from pasture-raised animals. In the years that I have been thinking and learning about animal fats in the diet and writing this book, animal fats have started to receive more and more approval from the scientific community, chefs, and consumers. I am so proud that Michael Ruhlman, himself a fan of schmaltz has written the forward and that Sally Fallon Morell, author of Nourishing Traditions and Nourishing Fats: Why We Need Animal Fats for Health and Happiness said about my book, “Give yourself permission to eat healthy animal fats Andrea Chesman’s way and you will never feel hungry or unsatisfied again. I hope you will consider buying my book and coming to see me at one of my signing events (check my events page). There are three zucchini growing on this one plant. As surely as the sun moves farther south in the sky, zucchini returns in abundance. I plant only one single zucchini plant, but even one can result in an overabundance. People always ask how to preserve zucchini and I tell them, you can preserve zucchini, but why bother? Zucchini pickles will always be mushier than cucumber pickles, frozen zucchini slices are too mushy to even consider eating, and grated frozen zucchini is a good only for zucchini breads and cakes. You can use it to add bulk and moisture, but it won't add anything in the way of flavor and very little in terms of nutrition. Over the past few years, as I developed recipes using animal fats for my forthcoming book, The Fat Kitchen, I've taken a fresh look at all my favorite recipes and revised any that call for canola oil, which I no longer stock. Olive oil or melted butter works fine as the fat in the recipe below, and keeps it vegetarian. But -- and this should not be a surprise for anyone who is familiar with cooking with it -- duck fat, chicken fat, and bacon fat are all delicious here. My kids love these “zucchini pillows.” The texture is softer than a bread and denser than a soufflé, with just the trace of crunch from the onions. It makes a great side dish, especially on a picnic, where the squares can be eaten out of hand. You can use overgrown zucchini here. 1/2 cup olive oil or melted and cooled butter or other animal fat (duck fat, chicken fat, goose fat, bacon fat, lard, or tallow). 1. Combine the zucchini and salt in a colander and toss to mix. Set aside to drain for 30 minutes. Squeeze out the excess water. 2. Preheat the oven to 350° F. Butter a 7- by 11-inch or 9-inch round baking dish. 3. In a medium bowl, stir together the flour and baking powder. Add the zucchini, cheese, thyme, and pepper. Mix well with a fork, breaking up any clumps of zucchini. In a small bowl, whisk together the olive oil or fat and eggs. Pour into the zucchini mixture and mix well. Spread evenly in the baking dish. 4. Bake for about 35 minutes, until golden. 5. Let cool on a wire rack for 5 minutes. Cut into squares and serve warm or at room temperature. Adapted from Serving Up the Harvest. © 2007, 2009 Andrea Chesman. Cooked lentils: brown lentils (top), black beluga lentils (right), red lentils (bottom), French green lentils (left). This is the time of year when menu fatigue sets in—at least in the North, where the snow is still retreating and there is little hope of locally grown vegetables for at least six weeks. Have you thought about expanding your lentil repertoire to bring new flavors to the dinner table? Lentils? New life? Aren't lentils boring? Hardly. I recently taught a class on cooking with lentils called "Lentils in Many Languages" because there are so many cuisines to draw from when it comes to making them. Lentils originated in the Middle East at least 8000 years ago, maybe even 13,000 years ago. They spread throughout the Middle East and South Asia soon thereafter. So of course, there are some delicious Middle Eastern dishes, like Mudjara, which a Syrian friend taught me to make. All it takes is rice, lentils, onions, and buttermilk, and it becomes one of those dishes that is far greater than the sum of its parts. Mudjara is one of the many, many lentil dishes that is believed to be the porridge for which firstborn Cain (a hunter) in the Bible sold his birthright to Abel (a farmer). Whether the story is true or not, the dish is good enough to make the story credible. There are some 200 varieties of lentils to choose among, not that your local grocer is going to stock them all. The red, yellow, and pink lentils tend to cook to mush, making them good for soups and purees, like the dahl recipe I have below. The round French green lentils (lentiles du Puy) and black lentils (also called beluga lentils) hold their shape well, making them perfect for salads. Earthy green or brown lentils are the most common. Although I love to try out new recipes from time to time, dishes that don't really require following a recipe precisely are the building blocks of my meal repertoire. Both Mudjara and Dahl are excellent for that purpose – simple dishes that are so foolproof, they can be made without consulting a cookbook. This may be an odd confession from someone who writes cookbooks, but we are all full of contradictions like these lentil dishes—simple to make but complex in flavor. Curried Dahl. Serve as side dish with an Indian meal or make it a main course and serve over rice. 1. Combine the lentils, water, and salt in a medium saucepan and bring to a boil. Cover, reduce the heat, and boil gently until the lentils are completely tender, 30 to 40 minutes. 2. Meanwhile, heat the ghee in a small skillet over medium heat. Add the onion, garlic, ginger, and cumin and sauté until the onions are golden, about 10 minutes. Keep warm. 3. When the lentils are completely tender, stir the onion mixture into the lentils and continue stirring until the lentils are creamy. If the mixture is too loose, increase the heat and let boil until the mixture thickens to a pleasing texture. The lentils are done when they have the consistency of creamed corn. Taste and add salt if needed. Add more ghee for a richer, more luxurious dish. Garnish with cilantro. Just six ingredients make up this dish. Note how the red lentils turn yellow when cooked. Adapted from Recipes from the Root Cellar by Andrea Chesman. ©2010 Andrea Chesman. All rights reserved. Not most beautiful dish in the world, so a colorful salad is a good accompaniment. A Syrian rice and lentil classic, this dish has as many variations as it has spellings, including mjudra, mujadra, and mejadra. 1. In a medium-size saucepan, cover the lentils with water by about 3 inches and add 1/2 teaspoon salt. Bring to a boil, then reduce the heat to a gentle boil, and cook until the lentils are tender but still hold their shape, about 25 minutes. Drain and rinse the lentils with hot water. 2. Meanwhile, combine the rice, 1/2 teaspoon salt, and 3 1/4 cups water. Bring to a boil, then reduce the heat to a simmer, and cook until the rice is tender and the water absorbed, about 30 minutes. 3. While the rice and lentils cook, heat the olive oil over medium-low heat in a large saucepan. Add the onions and cook, stirring frequently until the onions are golden, about 10 minutes. 4. Add the cooked lentils and rice to the onions. Add the buttermilk to moisten and bind the mixture. Season to taste with salt and pepper. Serve warm or at room temperature. A few simple ingredients, plus rice, make this dish greater than the sum of its parts. The perfect latke is crisp, not greasy, is golden brown on the outside and snowy white inside. Bring out the latkes: Hanukah is coming. For most people, said latkes, grayish, greasy pancakes slathered with sour cream and applesauce are beloved just because they remind them of home. But what if your latkes could be brown on the outside, snowy white on the inside, and not at all greasy? I'm here to help you make your latkes (potato pancakes to non-Jews) perfect. The Jewish holiday of Hanukah—the Jewish festival of lights—runs from December 12 to December 20 this year. It is a holiday that celebrates a miracle after the destruction of the Temple in Jerusalem when the flame of the eternal lamp burned for eight days until more oil could arrive, even though there was only enough oil in the lamp for one day. The holiday is traditional celebrated with candle lighting and eating fried foods. Back in the old country, this was the time of year when a goose would be slaughtered to provide the cooking oil. Geese were the poultry of choice in Eastern Europe, prized for their down, rich meat, and copious amounts of fat. They were also prized because they could thrive on forage and didn't need shelter from the cold weather. It was hoped that the goose fat would last long enough to make matzoh balls for the Passover celebration in the spring. Christian neighbors slaughtered their pigs at the same time, and rendered lard for frying their potato pancakes. These days most Americans fry their potato pancakes in vegetable oil, even though chicken fat (schmaltz) or lard is readily available. This recipe change happened sometime in the 1900s when polyunsaturated vegetable seed oils were touted as "heart healthy." This lie is more than adequately exposed by Nina Teicholz in The Big Fat Surprise, among others. So scratch the idea that vegetable seed oil frying is better for you than frying in an animal fat. Beyond the health aspects, vegetable oil seeps into the pancakes in a way that an animal fat does not. This year, fry your potato pancakes in any rendered animal fat you can get your hands on. (You can find information on how to render fat in my book The Backyard Homestead Book of Kitchen Know-How or at a blog post I wrote for Mother Earth News: https://www.motherearthnews.com/real-food/goose-fat-is-pure-gold-zbcz1612). Making the interior of the latke snowy white is as simple as could be. Grate the potatoes in a food processor, or by hand on a box grater. Put the grated potatoes in a bowl of acidulated water (1 tablespoon lemon juice or vinegar to 4 cups water) and swish it around to wash away the starch, which is what browns. Drain well. Swish the potatoes in a bowl of acidulated water and drain well. Then take half the potatoes, return them to the food processor, pulse until mostly pureed, and return to the potatoes. This step ensures you get the denser filling of a potato pancake, not the lacy texture of potatoes rosti. Add a grated onion (very important!) and eggs to bind. Then fry the potato pancakes in about 1/2 inch of rendered fat. For the best texture, half the potatoes are coarsely grated, half are almost pureed. Perfect latkes! Here's my recipe, adapted slightly from Serving Up the Harvest. This year I fried in rendered chicken fat, but any animal fat yields great results! 1. Coarsely grate the potatoes by hand or in a food processor. 2. Transfer the potato mixture to a large bowl filled with acidulated water (1 tablespoon lemon juice or vinegar to 4 cups water). Swish around with your hands for 1 minute. Pour into a strainer and drain well. Place a clean kitchen towel on the counter. Dump the potatoes onto the towel and pat dry. This step will keep the potatoes from turning pink, then gray as they are exposed to air. 3. In the food processor, grate the onion. Replace the grating blade with the regular steel blade and pulse the half the potato mixture until finely chopped but not pureed. 4. Transfer the potato mixture and the grated potatoes to a large mixing bowl and add the eggs, salt, and pepper, mix well. 5. Preheat the oven to 300° F.
6. Heat 1 inch of any animal fat in a frying pan over medium-high heat. Drop the potato mixture, 1/4 cup at a time, into the pan and fry until golden on the bottom, 1 1/2 to 2 minutes. Turn and fry on the other side, about 1 1/2 minutes. Drain on wire racks. 7. Keep the latkes warm in the oven while cooking the remaining batter, but serve as soon as possible. Pass the applesauce and sour cream at the table. When I was about five years old, my family took a trip to New York City to visit relatives and then to have dinner with an army buddy of my father. It was well before GPS or Google maps, and my father got lost in Brooklyn, refusing to stop and ask for directions. By the time we got to the restaurant, I was starving. Rice pudding has been my go-to comfort food since I was five. My mother ordered lamb chops for me, normally a favorite. But at this Greek restaurant, they arrived smothered in a spinach sauce. I wept. I wailed. I was inconsolable. A waiter came by, removed the offending chops and replaced them with a soup bowl filled with rice pudding. Heavenly! Rice pudding has been my favorite dessert—no, my favorite food since then. It would be included in the menu of my last meal, should I ever knowingly hav a last meal. I have made it my birthday dessert instead of cake many times. I frequently make it to sell at the coffee house concert series my husband and I run in the Ripton town hall. And in every cookbook I have written, I have tried to slip in rice pudding, so I could enjoy re-testing the recipe. No, it isn't in my pickle book, nor in any of my other vegetable books. But, various iterations appear in 366 Delicious Ways to Cook Rice, Beans, and Grains, 250 Treasure Country Desserts, and The Backyard Homestead Book of Kitchen Know-How. Baked rice puddings have never met my standards: too dry, not creamy enough, though I have iterations in both 366 Delicious Ways to Cook Rice, Beans, and Grains and 250 Treasured Country Desserts (meeting those number requirements is tough!). In 366 Delicious Ways to Cook Rice, Beans, and Grains I have a eight different rice pudding recipes. In 250 Treasured Country Desserts, I have only six, including ones made with vanilla yogurt replacing the custard, coconut milk replacing the traditional cow's milk, and black rice replacing the traditional short-grain rice. In 250 Treasure Country Desserts, my favorite recipe was the Creamy Rice Pudding, which is made by cooking short-grain rice in milk, then folding in a stirred custard made with three eggs. I tweaked that recipe for The Backyard Homestead Book of Kitchen Know-How, because those recipes were designed to be economical (what the French might call la cuisine de bonne femme) and use up leftover cooked rice, excess eggs and, perhaps, milk. That recipe uses four egg yolks and is everything I can ask of a rice pudding: creamy, delicious, and as comforting as the bowl I had in the Greek restaurant when I was five. But something nagged me about that recipe, perfect though it tasted. It was those egg whites. I hated to waste them. So the last couple of times I made this recipe, I beat the egg whites with sugar and folded them into the pudding. Cloud-like perfection! Now the question is how to incorporate this revised recipe into the cookbook I am currently working on, which is all about cooking with animal fats. I am thinking I may embellish the recipe with apples caramelized in duck fat. Now doesn't that seem like a great idea? Rice Pudding with Duck Fat Caramelized Apples will probably be included in my next cookbook. 1. Combine the rice, milk, and salt in a large heavy saucepan over medium heat. Slowly bring the milk almost to a boil, stirring frequently to prevent scorching. 2. In between stirring the milk, combine the egg yolks and 1/3 cup sugar in a bowl and whisk until well blended. 3. Test a grain of rice. If it is pudding soft, then continue. Otherwise continue to stir over medium heat until the rice is fully softened. Slowly add about 2 cups of the milk and rice mixture to the egg yolk mixture, stirring constantly, to temper the egg yolks and prevent the eggs from curdling. Pour the tempered eggs into the pot with the milk and bring to a boil, stirring constantly, until the mixture has thickened and coats the back of the spoon. You should be able to run your finger through the velvety coating on the back of the spoon to leave a distinct trail. which happens at about 170°F, if you have an instant-read thermometer. 4. Stir in the vanilla. Transfer to a bowl and lay a sheet of plastic wrap directly on the pudding’s surface to prevent a skin from forming. Chill for at least 1 hour, until the mixture is no longer warm. 5. In a stand mixer fitted with a whip, beat the egg whites, gradually adding the remaining 1/3 cup sugar. Continue to beat until soft peaks form. Stir one-third of egg whites into the pudding to lighten it. Then gently fold in the remaining egg whites until no white streaks remain but take care not to overmix and deflate the egg whites. Serve at room temperature, or chilled. I taught a class on food preservation this summer at Sterling College and one of the things that had my students stumped was the idea of putting on the screwbands on the canning jars just "finger-tight." "Finger-tight"—the term is courtesy the National Center for Food Preservation (the ultimate authority on food preservation)—is something of a misnomer. I suppose they chose the term to distinguish it from Ninja-tight or "plumbing-tight" but it implies a certain delicacy when a certain firmness is needed. If a screwband is applied too tightly on a canning jar, there is the potential that the jar will explode in the canner. But if the screwband is applied too loosely, the contents of the jars can bubble out, deposit food debris on the rims, and prevent a good seal. To tighten screwband, turn handle until arrows align. In any case, this is the time of year I when I can tomatoes, when the kitchen is cooled off (and before my freezer fills with a half pig share). My tomatoes were dumped into jumbo plastic bags and unceremoniously frozen last summer. I dump the tomatoes still frozen into a stockpot and cook them down into puree or paste. Just dump the frozen tomatoes into a stock pot and begin cooking. After the tomatoes have cooked down, strain out the seeds and skin. For my most recent batch, I made paste, cooking down the strained puree in an uncovered stockpot for about 16 hours, until a spoon leaves a trail when the paste is stirred. Per USDA instructions, I added 1 teaspoon of citric acid. Cook down the puree until a spoon will leave a trail. A slow cooker ensures the paste doesn't burn -- and it is easier to clean than it looks. The formula is 14 pounds of tomatoes, cooked down to 8 or 9 half pint jars, with 1 teaspoon of citric acid. I poured the paste into canning jars, leaving 1/2-inch head space and sealed the jars with my new band-tightening tool. Then I processed the paste for 45 minutes. When preserving tomatoes, you get more bang for your buck with plum tomatoes (meaning more can be put in a jar, but I can a mix of tomatoes, whatever I need to preserve. For gardeners who love tomatoes, tomato season is both a joy and a burden. It's a joy because nothing beats a fresh tomato as a snack, as an add-on to a sandwich, as a quick sauce for pasta, as a side dish, sliced and topped with a drizzle of oil and vinegar and a sprinkling of salt. As we walk through the garden, we pop cherry tomatoes in our mouths, almost without thinking. The thinking part does come. What to do with all those tomatoes? Whether all those tomatoes will be enjoyed fresh or whether they will be canned, I have a recipe for you. 101 One-Dish Dinners is filled with recipes that bring dinner to the table quickly, with a minimum of fuss. There are a lot of my family favorites contained in those pages, a lot recipes that are streamlined for speed and ease. These are the recipes that my husband makes when I am out of town and my adult kids make for themselves and their friends. The one ingredient that makes a lot of these recipes sing is the tomato—fresh in one-dish salads, canned in soups and stews you might want to make when the weather cools. In fact, I counted 22 out of 101 recipes that use tomatoes in one form or another. So, let's say you might want to make one of these recipes every two weeks or so. That means you'll want to put up 26 quarts of tomatoes. But, of course, just about everyone is going to want to make some form of spaghetti—with meat sauce, with sausage, or with a simple tomato sauce—every two weeks, so that's another 26 quarts of sauce or puree you'll need. Homemade pizza is so much better than the greasy store-bought or delivery pizza, so add another 14 quarts of sauce or puree. That's 64 quarts of tomato products. And I haven't even thought about ketchup or salsa yet. While I am in a calculating mood, let me add that a lot of recipes in 101 One-Dish Dinners and elsewhere call for a 28-ounce can of diced tomatoes. That's equivalent to a quart of home-canned tomatoes (mine weigh in at anywhere between 25 and 40 ounces, depending on the variety and how much I managed to squish in). Another way to look at equivalents is that a 28-ounce can holds 3 cups. So you can drain your home-canned tomatoes (save the juice), measure, and return enough liquid to make 3 cups. Or just figure that your quart of home-canned tomatoes is equivalent to a 28-ounce can and don't sweat the difference. Tuscan Tuna Salad with White Beans -- served with a sourdough biscuit from The Backyard Homestead Book of Kitchen-Know-How. Now I have to go—I have more tomatoes to can. And when I'm done, I'll whip up a dinner with a recipe from One-Dish Suppers. Last night I made a Mediterranean Tuna Salad with White Beans and the night before it was Antipasto Antipasta Salad. Quick one-dish meals make life so much easier when you are busy. The year 2015, according to the Chinese zodiac, was the year of the sheep, and I did buy a sheep – well, actually a whole lamb for the freezer. The next Chinese year, beginning February 8, will be the year of the monkey, and well, yechhh. Instead it will be the year of the pig for me and my family. I have just stowed away 75 pounds of succulent pork from Understory Farm, in Sudbury, Vermont. After talking to a few different farmers at the Middlebury Farmers’ Market last August, I decided to buy from Greg and Jessie Witscher, who could only offer me a half-pig share in late December. While I doubt there is a local farm I wouldn’t want to buy from, I especially like the story behind my pig, a Tamworth (75%)-Berkshire (25%) cross. Berkshires are known for their excellent mothering skills and pleasant dispositions. Greg told me, though, that after many years he is leaning more and more toward Tamworths, which are known for their enthusiastic foraging skills, their ability to thrive in inclement weather, and their long skeletons. I liked the idea that this pig was raised on pasture and woodland forage and fed non-GMO grain and high-quality milk. The milk was brought in twice a week from Animal Farm in a Vermont town called Orwell (I’ll pause here; get the joke?) where Diane St. Clair makes butter that is sold at the French Laundry and Per Se, two famous restaurants run by Thomas Keller. I’m name dropping here but, if fact, St. Clair doesn’t use the milk her Jersey cows produce, only the cream. So the pigs make quick work of the milk, and I’ll make use of the pork. When you buy a whole or half animal from a farmer, you are usually given a price per pound that reflects the hanging weight (the carcass minus blood, guts, skin). What you actually receive is about 75 percent of that, depending on whether you take the “nasty bits” or offal (liver, heart, head, trotters) and lard. My 100-pound half-pig yielded me 75 pounds of porky goodness; and the $6 per pound I paid for the hanging weight, ended up costing me $8 a pound for meat. Yes, that’s a lot more money than you might pay at the supermarket—but I know that I am getting antibiotic-free, “clean” meat that is richer in vitamins D and E and omega 3 fatty acids. I also know that this pork, being local and raised on local foods and forage, had a small carbon footprint; having being raised responsibly, it had a small environmental impact on the land. It’s hard to envision what 75 pounds of meat means, but it mostly fit on two freezer shelves. I got 17 pork chops, all cut at least 1 inch thick (any thinner and it is hard not to overcook, which renders the meat dry and tough), 4 pounds of ground pork, 4 shoulder roasts (the cut you want for barbecue), and 1 small tenderloin. I had the ham split and smoked to yield two 4- to 5 pound hams. There are two very small racks of ribs, four large country-style ribs, and eight 1-pound slabs of fresh pork belly, some of which I will braised and some I will cure to make bacon. There are also neck bones for a stew, smoked ham hocks, trotters (both will flavor beans), half a head, 3 pounds of leaf lard, and 2 pounds of back fat. The meat all came to me frozen, but I couldn’t wait to test out the flavor of a chop. I made a rooky mistake and didn’tmake sure it was fully defrosted before it hit the hot pan – that’s why you don’t see a good sear on the middle. But the flavor? Juicy porky goodness. Steam Canners are Safe to Use! I have a guilty secret. For years, I’ve been canning my high-acid foods (pickles, fruit, jams, and tomatoes) in a steam canner—even though the USDA has frowned upon the practice and even though I have taught classes using the boiling water bath canner. It was a “do as I say, not as I do” practice. I use the steam canner to process tomator puree. Finally, too late to include in my new book, The Backyard Homestead Book of Kitchen Know-How, researchers from the University of Wisconsin, Madison, funded by a grant from the USDA and the National Center for Home Food Preservation (NCHFP), have concluded that steam canners (properly called “atmospheric steam canners” to distinguish them from pressure canners which use pressurized steam) can be as safe and effective as water bath canners when properly used to preserve acidified or naturally acidic foods. Why do I prefer the steam canner to the boiling water bath canner? Because they speed up food processing. 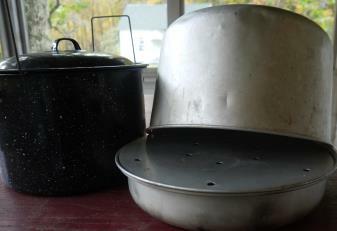 The boiling water bath canner is a large pot with a lid and a rack to hold jars—large canners hold up to 9 quart jars and the small ones hold up to 7 quart jars. When you heat the water in a boiling water bath canner, you have to bring at least 5 quarts of water up to a simmering temperature. Then add your jars and wait for the water to come to a boiling temperature, adding even more water if needed to cover the jars with at least 1 inch of water. This can take 30 to 60 heat-filled minutes, before you even begin processing, depending on the size of your canner, whether the jars were hot-packed or raw-packed, and the BTU output of your stove. Heating water is faster in a steam canner than in a boiling water bath. By contrast, the steam canner is a 2-quart pot with a perforated metal rack for holding jars and a tall dome lid that allows a steady stream of steam to flow around the jars. There is less water to heat and less time spent waiting for the water to heat. Best of all, pickles are exposed to less heat during steam canning, resulting in crisper pickles. The University of Wisconsin released guidelines for using steam canners and I am replicated them here. My remarks are in square brackets. Adding citric acid to tomatoes acidifies them for safe canning. 2. Always use a research-tested recipe developed for a water bath canner. 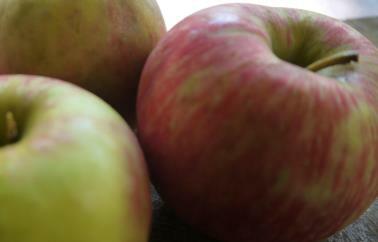 Acquire recipes from university extension programs or from the NCHFP (NCHFP.UGA.edu). The booklets that accompany steam canners usually don’t provide safe instructions. 5. Modify processing time for elevation — in general, add 5 minutes for each 1,000 feet you’re above sea level in elevation. 7. Cool the jars in still, ambient air. Cool jars on a rack or towel away from drafts. Don’t place them in the refrigerator to hasten the process. 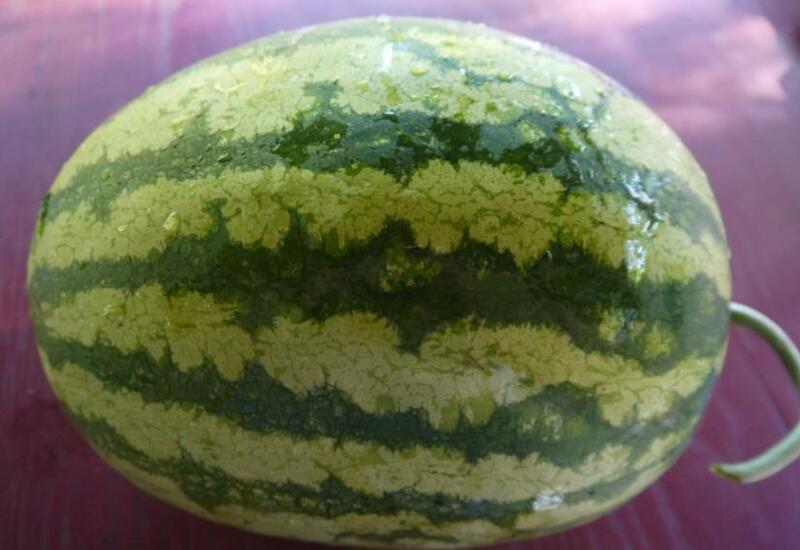 I am proud to say that I managed to get one really big watermelon from my garden this year. I know, I know, its no big deal to you valley dwellers, Southerns, and greenhouse growers, but it is a big deal to me. With the full moon this week, frost has been gently touched my garden. I harvested all my eggplant and have turned it into soy-sesame eggplant for the freezer. I turned my cucumbers in pickles.The cucumbers are sliced, then salted before I put them in jars. Covering the tomato plants may help me harvest a few more pounds, but most have been bagged up for turning into sauce later. 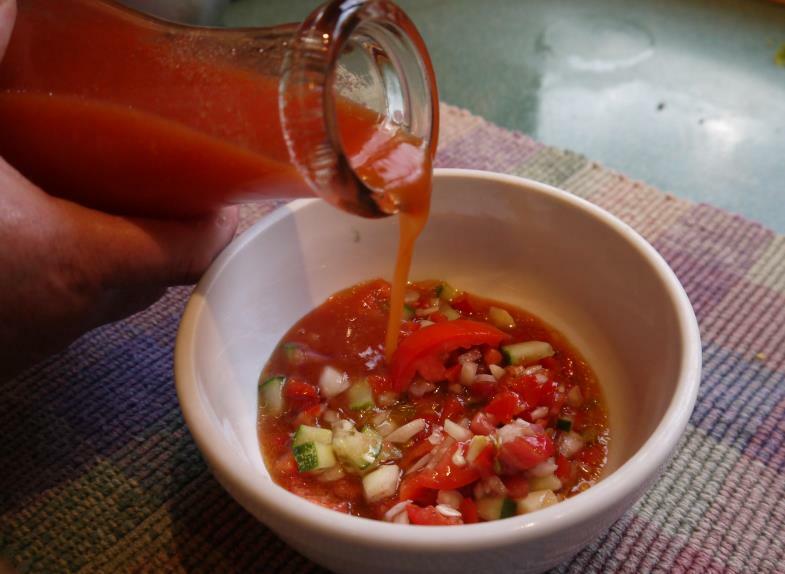 Gazapacho and fresh salsa have all been made and enjoyed. It's time to think about starting to clean up the garden. I gott go. Skordalia with fresh vegetables makes a perfect summer meal. This is the time of year when supper is easily just a plate of sliced tomatoes drizzled with olive oil and vinegar and another plate of sliced fresh vegetables (carrots, cucumbers, bell peppers) or blanched vegetables (green beans, waxed beans, broccoli). The vegetables, of course, require a dip. But not just any dip. If you tell me your go-to dip for fresh vegetables (crudités) is bottled (or even homemade) ranch dressing, I will tell you are undoubtedly suffering from dip fatigue. Have you thought about making skordalia—that magical Greek dip of potato, garlic, lemon juice, olive oil, and salt? It’s vegan, it’s dairy free, it’s easy to make and more delicious than its list of ingredients might make you think—and it’s the perfect way to celebrate a bounteous harvest of garlic. I love growing garlic. It is planted in the fall, when all hope of more harvests disappears from Northern gardens. Then it is the first sign of life when the snow retreats. The July harvest yields a space in the garden for fall crops, like another planting of beans or kale. Lots and lots of garlic makes skordalia super tasty. Be generous with the garlic and mince it as finely as you can. Make skordalia with high-quality ingredients and it becomes a magical dip greater than the sum of its parts. It’s a perfect dip for vegetables. The magic of skordalia is in its silky smooth texture, which you get if you use a stand mixer. My Kitchen Aid was given to my mother as a wedding fgift in 1941. 1. Put the potatoes in a small saucepan and cover with salted water. Bring to a boil and boil until completely tender, about 15 minutes. Drain well. 2. Transfer the potatoes, garlic, and lemon juice to the bowl of a standing mixer and mash. Beat over medium speed until the potatoes are smooth. 3. With the mixer at medium speed, very slowly pour in the oil until the mixture is velvety smooth and the oil has been fully incorporated. 4. Taste and add season with the salt as needed. Serve at room temperature. Recipe is adapted from Serving Up the Harvest. ©Andrea Chesman, 2004, 2007. All rights reserved. Sometimes when it’s too hot to cook, it’s too hot to eat. That’s when my brother makes an ice cream sundae and calls it dinner. You’ve got your dairy (protein), your eggs (protein), nuts (fiber and protein), he says. Why not? There are probably at least fifty reasons why ice cream for dinner is not a good idea, but my best, most convincing reason is a crisply chilled, herb and crunchy veggie–packed Vietnamese Rice Noodle Salad with Shrimp. You’ve got your protein, your veggies, and you don’t have to break a sweat. The recipe that follows is a combination of several recipes that appear in Mom’s Best One-Dish Suppers, which came out in 2008. Ever since then, this salad has been a summertime staple in my house. There’s not much cooking involved. The rice vermicelli noodles (a 7-ounce package) are put in a pot of boiling water, removed from the heat, then allowed to sit for 3 to 5 minutes before draining. A pound of frozen shrimp are dumped into boiling water and removed as soon as cooked through, about 5 minutes. In both pots the water should be as salty as seawater; it makes a big difference in flavor. The dressing has no oil; it is just a light, light combination of 9 tablespoons of fish sauce, 6 tablespoons fresh lime juice, 6 tablespoons sugar, and 2 minced garlic cloves – heated ever so briefly in the microwave until the sugar dissolves. Then it is combined with the dressing, shrimp, and noodles and put in the fridge. This can be done early in the day if you are the make-ahead type. In another bowl, I combine chopped herbs – a handful of cilantro and another handful or two of basil, mint, and or parsley. Woodchucks ate my basil(! ), so it is just parsley and mint here. I add it to a bowl with a about 4 cups of baby or torn salad greens, some sliced crunchy veggies – bell peppers, carrots, cukes, blanched green beans or broccoli. Snow peas or sugar snap peas are wonderful in this combo, and I’m lucky enough to be still harvesting them from my partial-sun garden. You don’t have to, but salads always look better if you take care with the knife work. A kinpira peeler is an inexpensive little gadget that makes lovely juliennes for carrots and daikon radishes. A mandoline will slice cukes paper thin. Snipping the noodles into short lengths makes it much easier to eat. I toss the veggies and spread them out on a plate or in a large shallow bowl. Again, this can be stuck in the fridge if you want. The veggies will hold up because they aren’t dressed. This handy little gadget, a vegetable peeler with a serrated blade, makes matchsticks easily. When I’m ready to serve, I just top the veggies with the shrimp and noodle mixture and garnish with chopped peanuts. A frosty beer or an off-dry German Riesling does not go amiss here. After a dinner like this, I feel great and happy to have put my garden-fresh herbs and veggies to such good use. My brother, on the other hand, needs to go on a 5K run to work off the sugar rush. I tapped my maple trees two weeks ago and still no sap to boil. I really don’t think spring will ever come, and as I write this at the tail end of March, it is 21°F out but Weather Underground says it feels like 12°F. And it does. It does! So what was I to think when this crazy email from my friend Hannah Davidson arrived, inviting me to join a seedling CSA at the Good Earth Farm in Brandon, Vermont. Really? A two-foot-deep blanket of snow still covers my garden. I’m just guessing here, but I really don’t think I am going to be able to sow seeds in mid-April for my usual spring greens and peas. This is Hannah’s first year selling her seedlings via a CSA, and it turns out seedling CSAs is the newest trend in small scale-agriculture circles. The grower, whose expenses all hit in the early spring for greenhouse energy and maintenance costs, soil, and seeds, gets money upfront. The gardeners get seedlings spread out through the planting season --- in this case, including plants for a fall harvest picked up in August – without worrying that the seedlings they want to buy will all disappear by the time Memorial Day weekend winds down. It’s the fall harvest plants that excites me with the idea of this CSA. I always plan to get a fall sowing in, and I almost never succeed. In the dog days of August, I stop believing that the weather will ever be cool enough to support another planting of lettuce or spinach. My check goes in the mail today. Two hundred dollars will cover five pick-ups of plants. Here’s what I’m going to be getting: The first pick-up of plants will be on May 2nd or 3rd and is scheduled to include two 4-packs of lettuce, two 4-packs of spinach, one 4-pack of kale, one 4-pack of chard, two 6-packs of snap peas, a bundle of 25 yellow and 25 red onions, and one each 4-inch pot of dill, cilantro, parsley, plus one 4-pack of my choice. The second pick-up will be on May 23 or 24 and will include one 4-pack of broccoli, one 4-pack of cabbage, one 4-pack of sauce tomatoes, one 4- pack of heirloom tomatoes, one 4-pack of peppers or chiles, one mixed 4-pack of zucchini/summer squash, two 4-inch pots of basil, and two free choice plants (larger tomatoes or perennial herbs or flowers). Third pick-up will be on June 6 or 7 and will include one 4-pack of butternut squash, one 4-pack of mixed pumpkins/winter squash, one 4-pack of musk melon/watermelon, one 4-pack of cucumbers, two 4-packs of lettuce, one 4-pack of eggplant, one 4-pack of brussels sprouts, and two free choice plants. The fourth pick-up on July 11or 12 will be light, but will include cucumbers, zucchini/squash, broccoli, storage cabbage, kale, chard, and more herbs for succession planting. Finally, the fifth pick-up on August 8 or 9, will include curly parsley, flat parsley, dill, kale, chard, lettuce, spinach, and broccoli. I am also committing to the idea of spring. Now if the weather would just cooperate. I’m not one of those people who keeps notes from one year to the next about the garden, nor do I race to plant the newest varieties featured in the seed catalogs. But I call myself a cook who gardens, and as a cook and an enthusiastic pickler, I am done with the traditional cucumbers that everyone grows. What everyone grows are slicing, or salad, cucumber varieties. There are many different cultivars, but they are all Marketmores to me—and they all have relatively tough, bitter skins and a tendency to be too seedy to make good pickles. And they all yield abundantly. So if you grow slicing cucumbers, you will have too many, so you will make pickles. And the pickles won’t be as great as they should be. Notice the small seeds of the larger, Mid Eastern cucumber. The part where the seeds are larger represents a week of rain. Even then, once the seeds are scraped out, the flesh is firm. The solution, you may think, is to grow pickling cucumbers. But no, don’t grow pickling cucumbers. They get fat. They get fat and seedy, sometime in the blink of a rainy afternoon. And, they hide underneath leaves, getting fatter and fatter. And don’t get me started on those white and yellow pickling cucumbers, with their tendency to become bitter in adverse weather. For the last couple of years, I have been growing Beit Alpha and Asian cucumbers – great for both slicing and pickling. These are long, either curved or straight, with generally tender skin. The flavor of the flesh is sweet and slightly aromatic (unlike the neutral wetness of a slicing cucumber). Yes, they require trellising, but the great thing about these cucumbers is that they don’t go from almost ready to be harvested to oversized in a day. They forgive you if you neglect your garden for a day or two. The Beit Alpha types, also called Mid Eastern types, are especially adapted to hot, dry climates, but I have had good luck with them in rainy, cool Vermont. Lebanese cucumbers are nearly seedless, smooth-skinned and mild, yet with a distinct flavor and aroma. Asian cucumbers (Fed Co Seeds call them “long-fruited cucumbers), such as Tasty Jade are spiny, slender, and long — as much as a foot long. Leave them on the vine and they just get longer, though after a point, they do become tough. These cukes are mild, slender, deep green, and have a bumpy, ridged skin. The best cucumbers are ones that you can eat in the garden—all flavor and thirst-quenching crunch. Bring the rest into the kitchen, slice and quickly brine in a little salted rice vinegar with chopped fresh herbs or red onions. Makes me long for summer right now. This is an almost seedless cucumber. As fall moves into winter, I’ve been teaching classes on cooking winter vegetables, including winter squash. Even though kale and beets seem to grab all the headlines, it is winter squash that is the most reliable of long-keeping winter vegetables. In terms of New England sustainability, Winter squashes may be the most important vegetable we have because of its ease of growing in this climate and easy storage. One plant will feed one person for a full season. When I teach about cooking with winter squash, I always gather a lot of different varieties, then cook and puree the flesh. I don’t flavor the purees, and we taste them one at a time, comparing the flavor and texture. The big surprise to the students is the Acorn squash. Its flesh is drier, stringier, and blander than the other varieties. “I know!” I say. “It is my mission to see Acorns lose their grip on their popularity.” And don’t get me started on the white (colored yellow) and golden (colored orange) Acorn varieties. They are even more lacking in flavor. Dark green Buttercups are confusing because sometimes the sport a small light blue turban and sometimes they don’t. Fans say Buttercup never needs added sweetener, but I think maple syrup is always welcome. The size of buttercup isn’t ideal, in my opinion. One buttercup yields enough for three people. Butternut, in my opinion, is the very best winter squash in terms of performance in the kitchen. It is easily peeled. Its long seed-free neck gives you a nice piece of squash that can be easily grated raw and sautéed for a quick-cooking winter squash dish. It is also easily cubed for roasting—and delicious combined with cubed root vegetables in a mixed vegetable roast. The flesh makes a smooth puree. And, according to the folks at Johnny’s Seeds, it is the longest keeping squash. Delicatas have edible skins, which makes them good for stuffing and slicing and roasting. The relatively small amount of flesh makes them a poor choice for pureeing. Lovely blue Hubbard squash makes the smoothest of winter squash purees. In terms of flavor it is my favorite. Working against its popularity is its very hard shell. You can crack it open with an axe, a drop onto a paved driveway, or by pounding a cleaver through it with a rubber mallet (my preferred method). When I first started growing Hubbards, I went for the full size ones – and some weighed as much as 40 pounds. These days, I go for the baby Hubbards, and I’ve noticed at farmstands, that the word “baby” has been dropped. Reverse supersizing? Deeply orange colored Red Kuri is a Hubbard variant. It has a relative soft skin that can be peeled like a butternut, but the same delicious – deep orange color. It is especially good for purees and soups. So called because its fibrous flesh resembles strands of pasta, Spaghetti squash is too sweet to be enjoyed as a pasta alternative, but it is really good with garlic and cheese or cream. If you are looking for an Acorn alternative, Sweet Dumpling is your squash. It is sweet-fleshed with an edible skin. It is a good candidate for stuffing, but also makes a good puree. In terms of cooking winter squash, the best thing is you can’t over cook them. If you oversteam and the flesh is watery, just drain in a fine-mesh strainer, before or after pureeing. Bake halved and seeded squash at 350° in 1 inch of water 45 to 90 minutes. Steam quartered and seeded pieces for about 15 minutes. Or roast peeled, diced cubes that have been slicked with a little oil at 425°F until lightly brown, 20 to 30 minutes. Oh, and those purees we tasted? After we taste them individually, I mix them together, add a fair amount of salt (very important to bring out flavor), some melted butter, and honey, maple syrup, or apple cider syrup. What a treat! My sourdough culture is older than yours. The sourdough was actually a big sluggish when I received it from Jane. After several feedings at 12- hour intervals, I gave it a boost with a half teaspoon of Fleishman’s yeast to get it nice and bubbly. Sourdough cultures need to be fed regularly with equal amounts of flour and water to keep it going. Neglect can be harmful, but not necessarily fatal. How regularly to feed a sourdough? Generally, at least every two weeks is the limit for a refrigerated culture, but really, as long as there is no sign of mold, it is fine. Some bakers will say mold can be removed, and the culture transferred to a clean jar. As long as the culture hasn’t turned black, it can be revived. I haven’t pushed a culture that far to know whether it is true or not. I used to be one of those people who claimed I didn’t care for sourdough bread. Then I started making the artisan-type no-knead loaves that baker Jim Lahey developed, and food writer Mark Bittman, among others, popularized. I found these breads a little lacking in character until I started making the bread with the sourdough culture for leavening. Now my breads, which take no more than 5 minutes of mixing and 2 minutes of shaping have plenty of flavor and texture.